Believe it or not, this election will determine whether political appointees can prohibit books and movies released during election years that criticize their policies or behavior. It’s well known that Citizens United v. Federal Election Commission concerns the role of money in politics, but it’s less often remarked that the decision centered around a 2008 film called “Hillary: The Movie,” a documentary critical of Mrs. Clinton. Arguing against Citizens United, a conservative non-profit, the Federal Election Commission made the case that because a film, such as “Hillary: The Movie,” was produced or distributed by a corporation (as are all commercial documentaries), it could be prohibited by the government. At oral argument, they went so far as to argue that such a ban could extend to books, pamphlets, and Internet sites produced or distributed by corporations. Fortunately, the Supreme Court said no. Unfortunately, four justices dissented from that common sense First Amendment ruling. With the death of Supreme Court Justice Antonin Scalia earlier this year, however, the court is now split 4-4 on this issue. If given the chance, the four liberal justices would likely vote to overturn the decision. Earlier this year, Justice Ruth Bader Ginsburg reasserted: “I’d love to see Citizens United overruled.” Similarly, Justice Stephen Breyer has said that without the ability to ban these types of independent expenditures, he knows of no way to make campaign finance regulations work and constrain campaign spending. Consequently, the next president will be in a position to determine whether this ruling gets reversed. No one on Donald Trump’s list of 20 potential Supreme Court nominees would reverse Citizens United. By contrast, Hillary Clinton, who has repeatedly criticized the Supreme Court’s decision, has made it clear that her nominees would reverse it. But even banning movies and books won’t stop all of the ways that those with money can influence elections. The wealthy can still buy television channels or newspaper companies. What’s next? Shutting down certain news channels during election years? Breyer and others blame soaring campaign spending on the Supreme Court’s 2010 decision in Citizens United. But the growth in campaign spending long predates Citizens United. In fact, the rate of growth has slowed since that decision. Campaign spending has increased, trailing federal government spending, rising from $1.6 billion in 1998 to $3.67 billion in 2014. Government spending during that same period soared from $1.7 trillion to $3.9 trillion, virtually the same percent increase. Is $3.67 billion really all that much to spend on political campaigns, after all? A single private company, Procter & Gamble, spent nearly a third more on advertising in 2013 — $4.8 billion — than was spent on all political campaigns during the two-year 2013–14 election cycle. 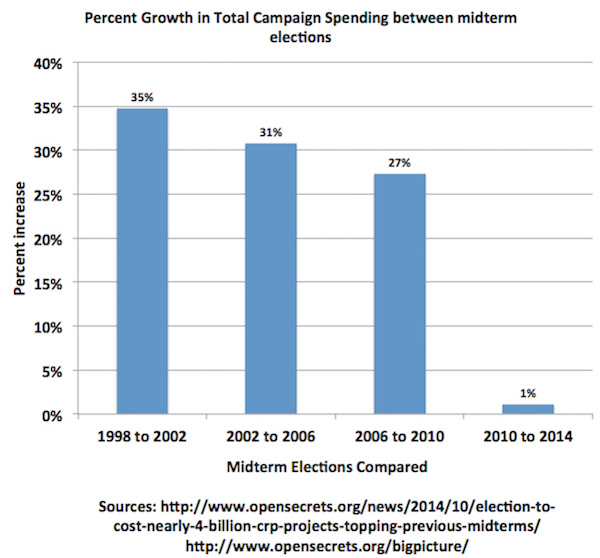 More important than the absolute amount, however, is the connection between the increase in campaign spending and the growth of government. This makes sense — the bigger the federal government, the more that is at stake. The higher the stakes, the bigger the fight we ought to expect. If federal spending still constituted just 2 to 3 percent of GDP, as it did 100 years ago, it is unlikely that people would care as passionately about the outcomes of this week's elections. But today, the federal government touches every aspect of our lives. In 2000, one of us published a study in the Journal of Law and Economics looking at expenditures on campaigns for governor and state legislature. The study accounted for factors such as the number of races, how closely contested they were, and whether state legislatures were narrowly divided. It showed that almost 80 percent of the increase in campaign spending was due to changes in the sizes of state governments. States with the fastest growing budgets saw the largest increases in campaign expenditures. Those who express the most outrage about campaign expenditures — liberal interest groups such as Public Citizen and politicians such as Democratic House leader Nancy Pelosi — are frequently the biggest cheerleaders for increased government spending. If they want less money to be spent on campaigns, they might want to think about making the government smaller. The growth in campaign spending is a symptom, not the cause, of what ails our democracy. Giving politicians dictatorial power to ban movies and books won't solve a thing; we will have given up our freedom for nothing. John R. Lott, Jr., is the president of the Crime Prevention Research Center and the author of The War on Guns. Bradley A. Smith is Chairman of the Center for Competitive Politics and previously served as Commissioner of the Federal Election Commission.